AEE (Civil/ Mech) in A.P. Panchayat Raj Engineering Service, AEE (Mech/ Electrical) in A.P. Ground Water Department. Interested and eligible candidates can apply for the APPSC AEE (Civil/ Mechanical) Govt Jobs through the online official website of APPSC is http://www.psc.ap.gov.in from 03-12-2018 onwards. The closing date is 24-12-2018. The candidates will be recruited based on the merit in written examination and interview. 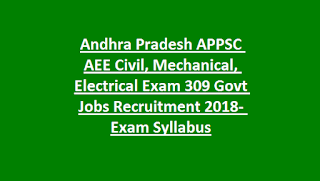 For more details regarding age limit, available vacancies, qualification, and how to apply are given below for the Andhra Pradesh APPSC AEE (Civil/ Mechanical/ Electrical) Govt Jobs Recruitment 2018. A.P Panchayat Raj & RD Engineering Service. A.P Public Health & Municipal Engineering Department. The age limit for the APPSC AEE (Civil/ Mech/ Electrical) Govt Jobs Recruitment is for Gen/OC category candidates is in between 18 - 42 Years. The upper age limit relaxation will be applicable for the SC/ST category candidates is 5years and for OBC/ Ex-s candidates is 3years and for 10years for PH candidates. The educational qualification for the AEE (Civil) is candidates should have done B.E/ B.Tech. Civil Engineering. For AEE (Electrical) is candidates should have done B.Tech Electrical. For AEE (Mech) is candidates should have done Mechanical Engineering. The salary offered for the selected candidates is Rs.37100 – 91450/-. The application fee for the General/ OBC candidates is Rs.250/- + Rs.120/-. For SC/ST category candidates the fee is Rs.250/-. Candidates will be recruited on the basis of written examination in the form of Computer based online test, Certificates verification, and interview. Prelims Exam conducted for 150 Marks. The written Test exam pattern will consist of 3 papers. The written examination will be conducted at Andhra Pradesh only. General Studies – 150 Marks for 150 Questions with time duration is 2 hours 30 Minutes. 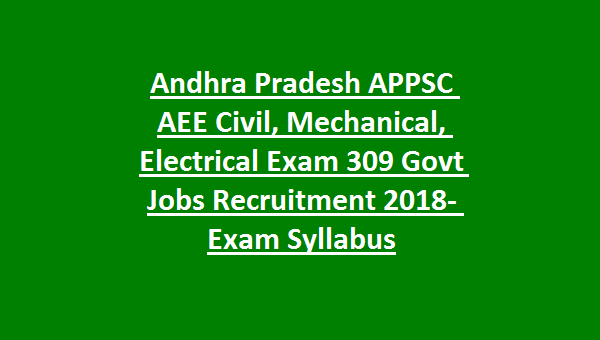 Interested and eligible candidates can apply for the APPSC AEE (Civil/ Mechanical) Govt Jobs through the online official website of APPSC is http://www.psc.ap.gov.in from 03-12-2018 onwards. The closing date is 24-12-2018.